Wahlstrom, 18, becomes the first player born in Maine to be selected in the first round of the NHL draft. Oliver Wahlstrom puts on a New York Islanders jersey after being selected by the team during the NHL draft in Dallas on Friday. 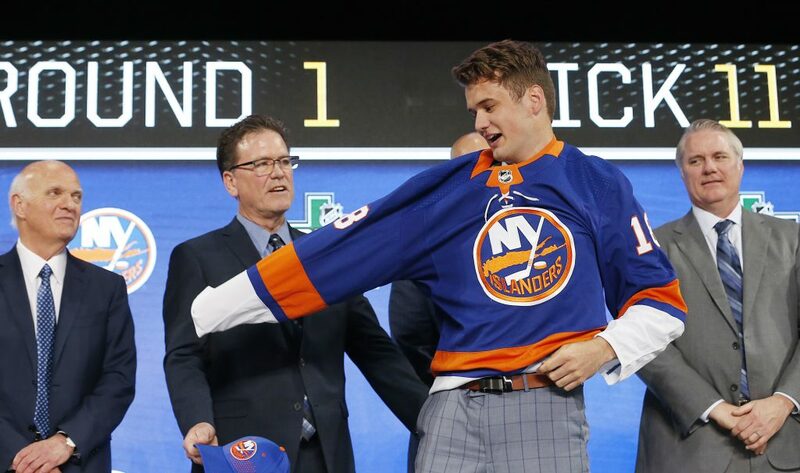 Yarmouth native Oliver Wahlstrom was taken by the New York Islanders with the 11th overall pick in the NHL draft Friday night, becoming the first Maine native selected in the first round. The only Americans selected ahead of Wahlstrom were two college players – forward Brady Tkachuk of Boston University, taken fourth by Ottawa, and Michigan defenseman Quintin Hughes, who went seventh to Vancouver. 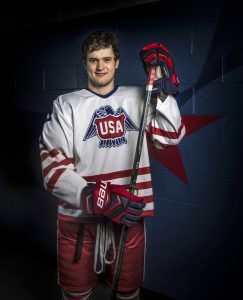 Wahlstrom grew up in Yarmouth and played for North Yarmouth Academy before going to prep school in Minnesota and then joining the U.S. National Development Team Program. He plans to attend Boston College this fall, and the Islanders would retain Wahlstrom’s rights until he leaves college and turns pro. Previously, three Maine players were drafted in the second round – Eric Weinrich of Gardiner in 1985 (32nd overall), Brian Dumoulin of Biddeford in 2009 (51st) and Brian Hart of Cumberland in 2012 (53rd). Wahlstrom, a 6-foot-1, 207-pound forward, was called “the best goal-scorer in the draft” by draft analyst Craig Button. He starred for the U.S. team that won a silver medal at this year’s U18 world championship, scoring seven goals in seven games. He was also on the gold-medal winning team in 2017. Wahlstrom was the leading scorer this season for the National Development Team with 48 goals and 46 assists in 62 games. Before Wahlstrom was selected, Swedish defenseman Rasmus Dahlin went first overall to the Buffalo Sabres, and Russian winger Andrei Svechnikov was drafted second by the Carolina Hurricanes. The Sabres taking Dahlin was expected since they won the draft lottery in April, and the 18-year-old wore a Buffalo Bills hat Friday prior to the selection. He’s the second Swedish player to be taken No. 1 and the first since Mats Sundin in 1989. Sundin went on to a Hall of Fame career. The selections after Dahlin and Svechnikov brought some surprises. Montreal took Finnish center Jesperi Kotkaniemi third, and Arizona went a bit off the board with center Barrett Hayton fifth, allowing high-scoring Czech winger Filip Zadina to fall to Detroit with the sixth pick. General Manager Jason Botterill and his staff met with Dahlin at the scouting combine in Buffalo and came away as impressed with the young Swede’s self-assessment as his on-ice talent. About an hour before the Sabres were on the clock, the Stanley Cup champion Washington Capitals made the first trade of draft weekend by sending veteran defenseman Brooks Orpik and backup goaltender Philipp Grubauer to the Colorado Avalanche for a second-round pick. The trade netted Washington the 47th pick, but most importantly cleared significant salary-cap space to attempt to re-sign pending free agent defensemen John Carlson and Michal Kempny. Grubauer was the first domino to fall in what could be a fascinating goaltending market. Ottawa’s Craig Anderson is reportedly available, and Columbus might have to make a decision on Sergei Bobrovsky if the two-time Vezina winner isn’t willing to talk about a contract extension with just a year left before free agency.